We recently moved and now unfortunately we have no more artificial turf but we plan on making it look nicer as soon as we can. The dogs have full run of the yard and come in and out of the house through a doggy door as they please still. The males are separated from the females. The males get let out from 6:00 am-6 pm unless it is too cold, too hot, raining or snowing. My dogs are mostly indoors but do go outside to use the potty and play. They always sleep indoors at night and during the hot or cold part of the day. Once our puppies start to walk and get around well, we let them in a playpen like this either in the house or outside to play for up to 6-8 hrs a day. Puppies don't usually start to get really mobile until 6 weeks of age. All of our puppies are raised indoors not outside, and they are only caged at night for there safety. I used to let all my puppies outside with all my other dogs starting at 6 weeks, but my vet recommended that I keep my puppies indoors. So this is what we use. And of course, all of our puppies are well socialized and played with by our 6 children on a daily basis. These pictures are my old set up with my old potty box system, we now use something a little different but the same concept. New pics coming soon. This is where mama and babies stay at until puppies start walking at 6 weeks of age. This is like a crib for babies, it is a safe pace where mom and babies can feel comfortable like a den where dogs naturally make their homes in the wild. We have a safety ben in for the first few weeks to ensure that no babies get their heads caught in between the bars. We also have a heating pad in to make sure babies stay nice and warm. Moms get let out to use the bathroom 4-6 times a day and are able to get out and run around for a total of 6 hrs a day. Once puppies are mobile they get put in a playpen for the majority of the day and placed back in there cage to sleep at night. My vet absolutely loved these cages as long as the puppies get let out, which they do. He also said these are the most hygienic and easy to keep clean for puppies as well as the safest. It is similar to what vets use in animal hospitals. 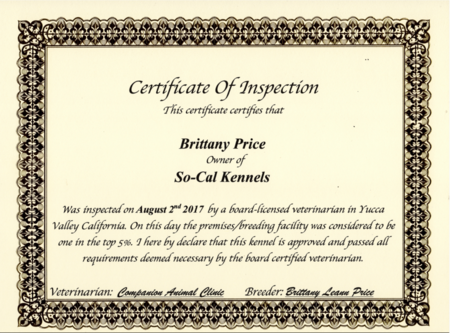 My vet did an inspection of our facility and rated us in the top 5% for cleanliness, safety and overall on how we run our business. 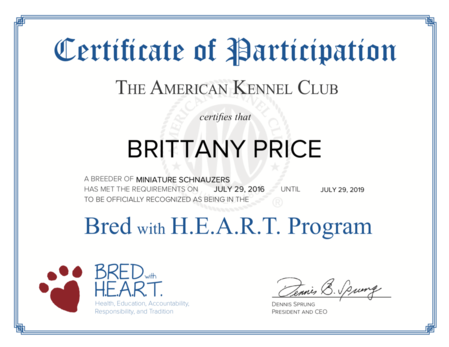 We are also part of AKC's bread with HEART program, we are required to do testing and to be inspected every 1-2 years. we have many certificates for completing educational classes through them. 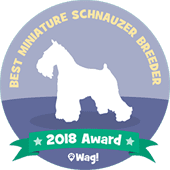 I have been deemed California's top Miniature Schnauzer breeder for the past two years and given this award.